There are several wilt diseases that affect tomato plants. Depending on the type of wilt, these diseases are caused by viral, bacterial, fungal and nematode pathogens. To treat wilt disease, you must determine which type is affecting the tomato plants, as fungicides and other chemicals are formulated for to combat different types of wilt. Fusarium wilt is caused by fusarium oxysporum, a soil-borne fungus. 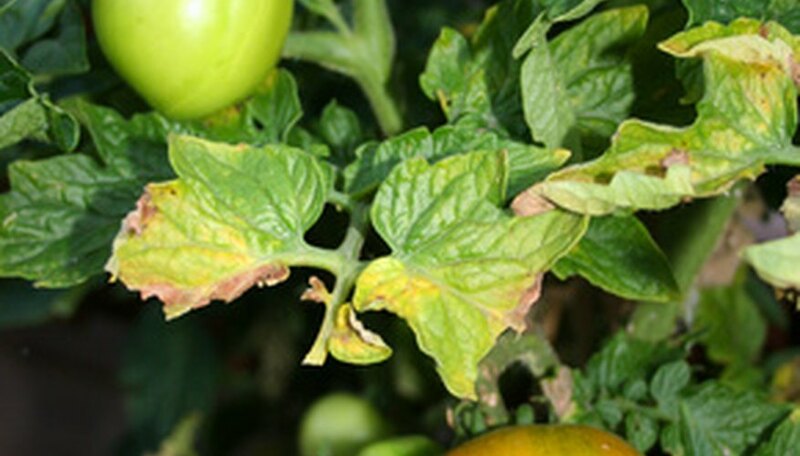 Fusarium oxysporum causes the lower leaves of infected tomato plants to yellow, then wilt. The yellowing and wilting might be on one branch, on many branches, on one side of the plant or on all of the lower branches. Branches and leaves higher up on the plant begin to yellow and wilt as the fungus spreads. The fungus enters the plant through its feeder roots and multiplies. It affects plants most severely when the temperature is between 78 to 90 degrees F. Tomatoes must be planted in well-drained soil to help stave off this fungus. Treat fusarium wilt with the chemical mycostop. Bacterial wilt is caused by pseuclomonas solanacearum, a soil-borne bacterium. Unlike other wits, bacterial wilt attacks plants without causing yellowing or spotting on the foliage. The bacterium is transferred to a planting spot (garden, field) via drainage water or via infested equipment. This particular pathogen overwinters in the soil; it is not killed by the cold. It infects tomato plants through roots and stems, usually entering the plant through an injury or open sore from nematodes. Pseuclomonas solanacearum invades the vascular tissue of the tomato plant and blocks the plant's water-conducting vessels. It generally affects plants when the temperature reaches 75 degrees F and above, and when the fields are wet. According to North Dakota State University, bacterial wilt cannot be cured. Infected plants must be discarded. Verticillium wilt is a soil-borne fungus caused by verticillium albo-atrum. It is easily confused with fusarium wilt because the symptoms are the same. The fungus (whether verticillium or fusarium) must be determined in a lab. It prefers cool, moist soil (temperatures 60 to 75 degrees F), so it is not as common as fusarium wilt in southern states. Treat verticillium wilt with the chemical mycostop. The TSWV is caused by a virus that normally is spread by thrips. The wilt causes the tomato plants to become stunted and die. The plant stops growing and becomes distorted in the early phases of the infection. Usually the leaves that are the first affected. Veins in young leaves might thicken and turn purple. The stems sometimes turn purple and the leaves bronze. This disease also causes necrotic (ring) spots on the foliage and the fruit. There is no way to control tomato spotted wilt other than keeping the garden and its boundaries clean of weeds where thrips live. Spraying with an insecticide helps to remove the disease-carrying bugs.